The DPDK Community Lab is an open, independent testing resource for the DPDK project. Its purpose is to perform automated testing on incoming patch submissions, to ensure the performance and quality of DPDK is maintained. Participation in the lab is open to all DPDK project participants. For some time now, the DPDK Community Lab has been gathering performance deltas using the single-core packet I/O layer 2 throughput test from DTS for each patch series submitted to DPDK compared to the master branch. We are pleased to announce that the Lab has recently been allowed to make these results public. These results are also now published to Patchwork as they are automatically generated. These results currently contain Mellanox and Intel devices, and the lab is able to support hardware from any DPDK participants wishing to support these testing efforts. To view these results, you can go to DPDK Community Lab Dashboard via the following link: https://lab.dpdk.org. The dashboard lists an overview of all active patch series and their results. Detailed results can be viewed by clicking on the patch series. If a patch fails to merge into master, a build log will show to help identify any issues. If a patch cleanly merges into master, performance delta results will show for each participating member. The Lab is hosted by the University of New Hampshire InterOperability Laboratory, as a neutral, third party location. This provides a secure environment for hosting equipment and generating unbiased results for all participating vendors. Lab participants, i.e. companies hosting equipment in the testing, can securely access their equipment through a VPN, allowing for maintenance and performance tuning, as the DPDK project progresses. The Lab works by polling the Patchwork API. When new patches are submitted, the CI server merges them with the master branch and generates a tarball. Each participating system unpacks and installs the DPDK tarball and then runs the performance testing against this DPDK build. When all systems have finished testing, the CI gathers the results into our internal database to be shown on the Dashboard, and sends final reports to Patchwork to show up on the submitted patch. This allows patch submitters to utilize Patchwork to view their individual results, while also allowing anyone to quickly see an overview of results on the Dashboard. The system provides maintainers with positive confirmation of the stability and performance of the overall project. In the future, we plan to open the Lab to more testing scenarios, such as performance testing of other features, beyond single-core packet I/O layer 2 throughput, and possibly running Unit Tests for DPDK. Additional features will be added to the Dashboard, such as showing graphs of the performance changes of master over time. If your company would like to be involved, email the Continuous Integration group at ci@dpdk.org and dpdklab@iol.unh.edu. As the DPDK community continues to make strides, we’d like to take some time to reflect upon successes of the past year and announce the winners of the inaugural DPDK Community Awards, acknowledging individual and team contributions to the success of the project. We have an amazing community that has been working hard to ensure DPDK’s success, so please join us in taking a moment to thank and congratulate each of our winners, and the entire developer community at large. 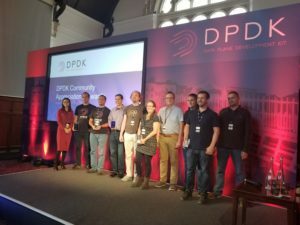 Winners were recognized September 5th at the DPDK Userspace event in Dublin, Ireland. Details about each award category and its winners appear below. Please join us in congratulating all of our nominees and winners! The community would like to recognize Thomas for his tireless work across many groups through the entire DPDK community. Thomas has been DPDK’’s primary maintainer since the open source project was established in 2013 and works in the background to keep the projects’ CI/CD infrastructure moving smoothly. Additionally, Thomas played a crucial role in designing the updated DPDK website. Jim’s passion for the project is unparalleled. He continues to champion and evangelize DPDK across a variety of mediums, regularly speaks on behalf of the project, and recently briefed a handful of industry media and analysts about the project. Konstantin Ananyev showed great initiative in creating an eBPF library for DPDK. This represents another step towards combining the best of DPDK and the kernel. Thanks to Shally Verma, Fiona Trahe, Lee Daly, Pablo de Lara Guarch and Ahmed Mansour, Compression API was a great collaborative, cross-vendor initiative to create a new acceleration API which helps to expand DPDK’s reach into new use cases such as storage. Congratulations to Tiwei Bie, Maxime Coquelin, Jens Freimann, Yuanhan Liu, and Jason Wang. This was another great collaborative effort to adopt the new Virtio 1.1 standard in DPDK, leading to a significant boost in performance in virtualized environments. Not only does Anatoly regularly and consistently contribute high-quality code, but his significant work in developing a memory hotplug resulted in a significant improvement to the project’s memory management subsystem. John’s work with DPDK documentation has not gone unnoticed by the community. He has taken on the job of main documentation maintainer, and does a lot of crucial organization and clean-up of the docs for each release. Thomas has been DPDK’s primary maintainer since the open source project was established in 2013 and works in the background to keep the projects’ CI/CD infrastructure moving smoothly. Ferruh is known throughout the DPDK community for his deep review work, which is consistently efficient and beyond helpful. Thank you to the Intel Validation team for testing each major DPDK release, and for open sourcing and maintaining the DPDK Test Suite (DTS).